Sick W16 and W26 smart photoelectric sensors love a challenge, so they really kick into gear when confronted with flashes, reflections and vibrations. Thanks to new technology, they particularly detect shiny, uneven, perforated and transparent objects more reliably than ever. They are not blown off course by unwanted light reflection. The highflier in object detection is not blinded by anything; it knows how things work. They communicate their findings too: the innovative operating concept using LED feedback makes it easier to adjust to each task within seconds. The Sick Smart Sensors W16 and W26 detect each situation, translate this into digital data, and communicate this via IO link or Bluetooth to their process environment. Since they actively support continuous automation networks, they open the door to Industry 4.0 (IIoT) and intelligent factories. Thanks to the Bluetooth interface, it is possible to access the sensor data from any mobile device. If the sensors report that ambient conditions have changed during the current process, their performance can be optimised via the Bluetooth interface in a few clicks. Thanks to the innovative LED display, BluePilot makes it easy to align sensors and reflectors as well as senders and receivers within seconds. In the case of the photoelectric proximity sensors, a push-and-turn element enables the sensor to be adjusted quickly and precisely, eliminating time-consuming fine adjustment using rotary controls. The unique combination of new effective technology for object detection provides a new dimension of detection reliability. Shiny and reflective objects no longer present an obstacle for TwinEye technology® or LineSpot and ClearSens technology. The new Sick photoelectric sensors W16 and W26 can also detect textured, perforated and even transparent objects without any problem. The smart photoelectric sensor intelligence is packed into a rugged housing made of VISTAL®, which consists of glass-fiber reinforced plastic and has a strength comparable to steel. The sensors can withstand extreme thermal, chemical or mechanical stress with ease. Smart Sensors provide indispensable input for every process chain. They support dynamic, real-time-optimised, and self-organised industry processes. The Smart Sensors W16 and W26 capture real-life situations, and generate and receive data and information beyond traditional switching signals or measured process parameters. The smart photoelectric sensors are the result of systematic streamlining of the comprehensive object detection product range. Both product families W16 and W26 have a standardised range of services, offering diverse application possibilities. 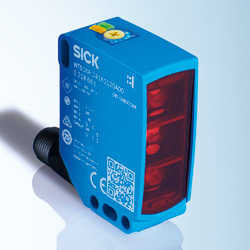 If you would like more information about Sick W16 and W26 Smart Photoelectric Sensors or would like to discuss a specific sensor application you may have, please call 01254 685900 and speak to a Technical Support Engineer or your FIeld Sales Engineer, they will be happy to answer your questions.